Caroline Gries had waited a long time for her trip to ancestral Germany. 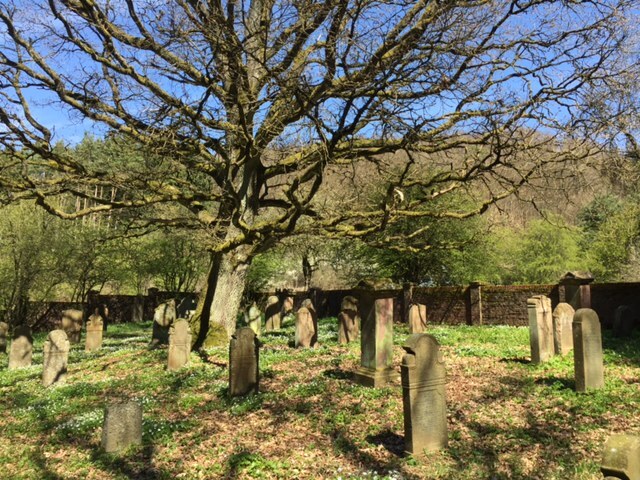 During the actual trip, what she looked forward to most of all was her visit to Waldgirmes, where she and her brother had already established contact with a local authority who is very knowledgeable about Jewish ancestry there. 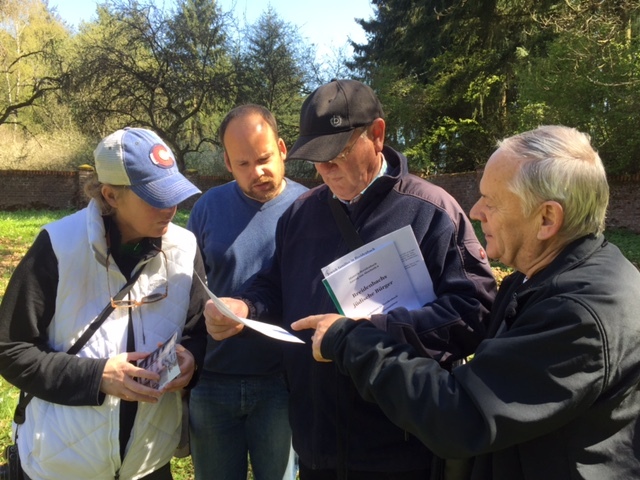 We arrived at exactly 9:15 for our appointment with Manfred Schmidt and his son, Andreas, who actually works for an institute dedicated to preserving Jewish cemeteries in the state of Hessen. Also there was a man who we learned in short order was a relative of Caroline’s – a real surprise! Out of respect for his privacy, we are not posting any photos or information about him. 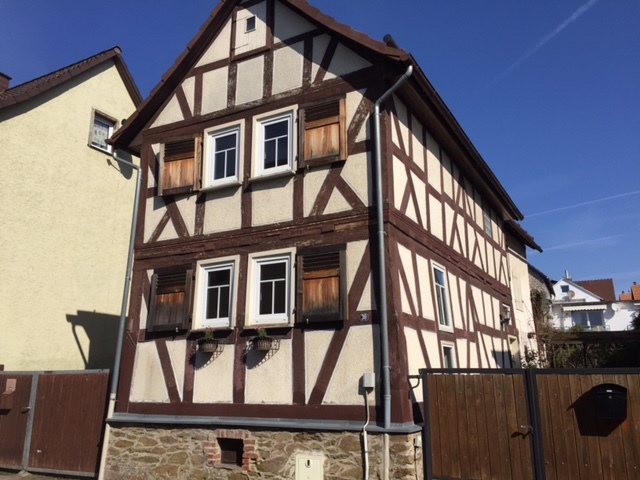 We met at an address that we soon learned was actually an ancestral house belonging to one of the earliest Jewish families to settle in Waldgirmes. This house was built by Caroline’s direct ancestor, Joseph Hirsch. The busy morning included seeing Stolpersteine in front of a house where Jews had lived before being deported, the last Jews in Waldgirmes. We also saw the World War I and II memorial, with an inscription about the murdered Jews of Waldgirmes. This was the first time in my long association with genealogy that I have ever seen a war memorial include the names of murdered Jews. 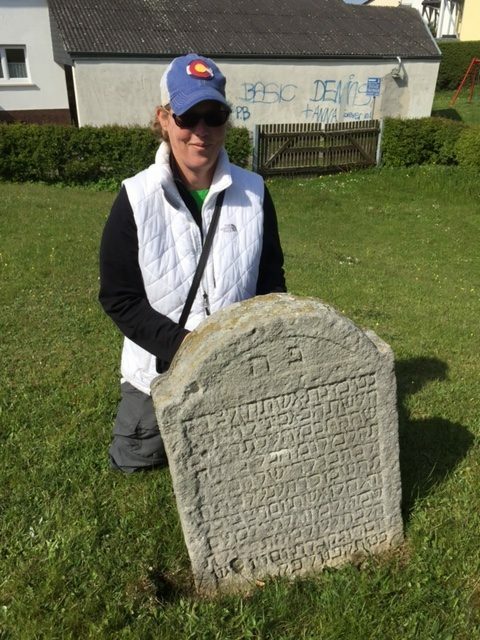 We saw the Jewish cemetery including some very old stones from the 1700s, which Andreas could read. Afterwards, we were invited to Caroline’s newly found cousin’s house for a lovely luncheon of fresh breads, meats and cheeses and of course, coffee or tea and sweats after. Breidenbach was next, and we followed the Schmidts over rolling hills and through heavy woods and small hamlets for the roughly 40 minute drive. Norbert Nosseck was waiting for us at the Jewish cemetery, located on the side of a hill on the east side of the village. We saw old stones including one for Caroline’s Lowenstein ancestor. 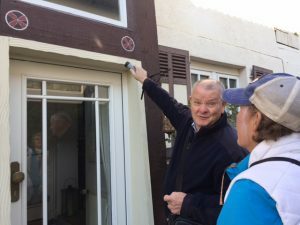 It was a beautiful day and many connections were made thanks to Manfred and Andreas Schmidt. 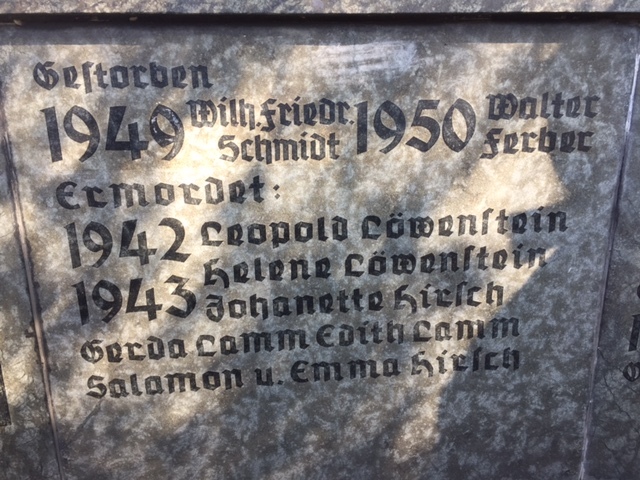 Posted in Family History Tours and tagged ancestry, breidenbach, germany, jewish, jews, research, waldgirmes.